Listen to Brenton Wood on Gimme a Little Sign and Oogum Boogum. "Brown-Eyed Soul isn't about color. It's a way of life—music that is passed from generation to generation like a family heirloom…the Latino culture is like one big family." So says L.A. soul singer Brenton Wood, and he should know, for his songs rank right alongside those of thee Midnighters, Billy Preston, the Shields, Ron Holden and the Thunderbirds and Rosie and the Originals as enduring East L.A. low rider classics. Wood is feverishly popular in the Latino community, and is part of the continuum of artists—the aforementioned along with many, many more—whose songs and reputations have risen to mythic proportions wherever Pendleton shirts, pachuko crosses and massive hydraulic systems are seen. Born Alfred Smith in Shreveport, Louisiana, his family moved to the Los Angeles area when he was still a boy. He became interested in music during the late '50s, first joining the Dootones and then forming the Quotations while attending Compton College, where he also took up piano. 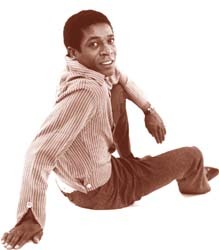 Like many West Coast teenagers of the day, Wood's biggest influences were Sam Cooke and Jesse Belvin. After working with Little Freddie and the Rockets, who released "All My Love" b/w "Too Fat" on Chief Records in 1958, Wood signed a song writing contract with the company that would become Double Shot Records, but spent the entire decade of the '60s writing and awaiting a hit of his own. That hit came in 1966 with "The Oogum Boogum Song." As good—and popular—as "Oogum Boogum" was, his next outing, "Gimme Little Sign"—with its bluesy, reggae-esque backbeat, rhythmic vocals, killer breaks and ingeniously simple Farfisa organ solo—was truly mesmerizing. To this day, it can fill virtually any dance floor, no matter what crowd happens to be present, within seconds. After "Gimme Little Sign," Wood was in the perfect position to continue churning out the classics; he'd been writing them to no avail for years!! He hit it hard with songs like "Baby You Got It" and "I Think You've Got Your Fools Mixed Up," though he could hardly lay claim to a cover of Double Shot label mates the Count Five's "Psychotic Reaction." As good as his own songs are, thank God he did it!!! As stated before, Wood's popularity amongst "Brown Eyed Soul" aficionados has continued to mushroom and he enjoys a dedicated following amongst the West Coast's Latino community, who regard him—and accurately so—as a true musical hero.